'Botanical Survey of Scotland', 1906. Naturalist Marcel Hardy is responsible for creating the 'Botanical Survey of Scotland'. Published by Bartholomew in 1906, the ambitious 'Botanical Survey' covered a far greater area of Scotland than its predecessors. It remained the best of its kind until the late 1930s. 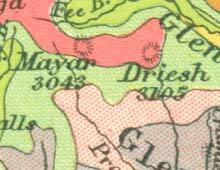 In Britain, the concerted effort to produce specialised maps began with the formation of the Ordnance Geological Survey in 1835. However, it wasn’t until the 1890s that ecologists became interested in mapping plant-life. Marcel Hardy later wrote 'as the Geological Survey had budded out of the Ordnance Survey, so now a Botanical Survey was budding out of the Geological Survey'. Pioneering Scottish botanists including Robert and William Smith drew from a European tradition. The survey work and maps they produced paved the way for Marcel Hardy's later map. Hardy's map is notable in that it was the first to show, on a single map, plant relationships in Scotland over such a large area. Hardy’s intention in producing such a map was not solely to record plant distribution. For him understanding the distribution of plants was fundamental in aiding attempts to repopulate the countryside following the Industrial Revolution. The 'Botanical Survey of Scotland' helped to ensure productivity and profitability for those who returned home from the cities. John George Bartholomew played an instrumental role in this rapidly growing area of cartography. Botanical maps found a sympathetic outlet in the journal of the (Royal) Scottish Geographical Society. John George was an Honorary Secretary of the society and one of its founding members. It was also in the firm John Bartholomew & Co that these maps found a publisher. In Scotland, after the publication of the 'Botanical Survey of Scotland', work in this field began to diminish. It regained popularity in the 1930s.